I have a question, predominantly for the teachers. I have been playing for a little over a year now. I play with my right hand closest to the utaguchi. I have noticed that this is the reverse of the observed standard (I think). If I were your student, would this be a problem? ...would this be a problem? If it's a problem for any teacher, you'd best get another one. I agree with Ed. Guys play either way. Yamato Shudo seems to be able to play everything both ways. I guess one way only wasn't hard enough. No problem many of the best players are lefties and play that way. Are you left handed in other areas? The only problem is when you play long flutes with offset holes they are usually offset for righties. I am also a 'Leftie', didn't realize that for a while, but that is how I initially preferred to hold the shakuhachi. What I like to do from time to time is to reverse and play as a 'Rightie', this is interesting as it indicates my 'habits' and repetitive routines, as when I reverse I don't fall into them, rather my playing takes on a very new feel, more deliberating, from which I always learn something fresh about either the piece I am playing, or my own attitude towards playing. Don't worry if anyone calls a Leftie 'sinister, we simply hold our swords in the alternate hand. Are you left handed in other areas? Not even a little bit. It was just one of those things where I did not know how to hold it, so I did it one way and it eventually felt natural. This is one issue where my views have changed somewhat, mostly because a lot of longer flutes shouldn't be offset in the first place (Japanese-made longer flutes often are not offset) and getting the holes moved on a flute you really like should not be much of an issue. I could easily understand a teacher correctly dismissing left-handed playing as "not a problem" for someone who has been playing that way long enough that switching is going to be a major hurdle. That would be if the student had previous left-handed playing experience with some other kind of flute (ney, East Indian, or NAF flutes often are played left-handed) or is an advanced student on shakuhachi who learned left-handed either by themselves or with a different teacher. Getting someone to switch with that much experience is going to be excessively difficult to correct something that isn't a problem for the 1.8 instrument he or she is learning on. However, for a brand-new-to-flute-of-any-kind beginner student who got their instrument and fooled around with it on their own left-handed, either accidentally or because they thought it would be cool to be different (and maybe read that it's a cool thing to do on shakuhachiforum), for just 3 weeks before getting a lesson, I find it hard to believe that most teachers dismiss it as irrelevant. Do teachers generally encourage left-hand on top? Or do they usually say "one hand, it doesn't matter which one, goes on top" when teaching hand-positioning to total beginners? If left-hand on top isn't being encouraged I'm curious why there are so many left-hand on top players. 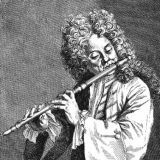 From observing non-flute players looking at and trying or pretending to play a flute, it seems to me to be entirely random whether they pick it up left or right hand on top. I have been playing for a little over a year now. My inclination would be to say that after a year you might as well keep playing left-handed. But, for other beginners, if it's been only a few weeks, or maybe even a few months, it's not like you have a ton of repertoire to re-learn, consider biting the bullet and switch. It'll make translating instructions and the offsets on longer flutes a non-issues in the future. I once read a little essay in Japanese by Iwamoto Yoshikazu. It was written for an Japanese audience and I read it in a Japanese language class which I attended the first 5 years I lived in Japan. Iwamoto discussed how it was teaching shakuhachi in England and how the students improved and approached the instrument. One thing I remember so clearly from that essay was that he described that most students in the first lesson would ask him how to hold the shakuhachi. He answered: 'As you like' to the students' surprise. The students would then ask 'Doesn't it matter which hand is on the top and which hand is at the bottom?' 'No, you do as you like and feel is natural for you' (conversation quoted of the top of my head). Then Iwamoto went on discussing that as a difference in the way of approach in Japanese arts in comparison with European arts.... well... I remember I found that less interesting. But this essay written by someone like Iwamoto shows clearly that it really doesn't matter which hand is where. it always felt most natural for me, likely because i never played recorder or some other such instrument. i also just let those i am teaching play whichever is natural. i actually avoid mentioning it until they've already picked the flute up 1st time. "Aged 25, he lobbied Annapurna Devi, the wife of Ravi Shankar and a sitar maestro in her own right, to teach him classical music. "I wanted to learn from the beginning," he says. It was three years before she relented, only after Chaurasia vowed that he would never again play the flute with his right hand. The promise, and its implicit commitment to starting all over again, reduced Devi to tears. "For the last 35 years I have been playing with my left hand," Chaurasia says. "I have forgotten how to play any other way.""